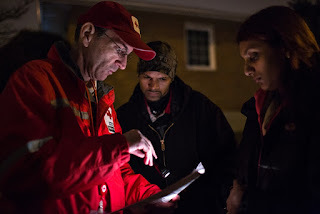 Red Cross volunteer Richard Gallis at the scene of a fire in Queens. Photo recently featured in Red Cross Red Crescent Magazine photo essay. Over the last 7 days, the Greater New York Red Cross provided emergency assistance to 115 adults and 55 children following 55 local disasters. Here are some highlights from last week and a preview of upcoming activities (see below). Last Monday, we posted a Q and A with former ICRC photo editor and current Chapter volunteer, Marko Kokic. Marko’ s photo essay of Greater NY Red Cross response volunteers was recently featured in Red Cross Red Crescent Magazine. Last Thursday, as part of our #MyRedCrossLife photo series, we posted a profile of Metro NY Red Cross volunteer, Maryann Russello. Last Friday, we posted a recap of our recent #GetAlarmedNYC fire safety event in Highbridge. The piece featured Bronx resident Josephine Vardipoul who benefited from the free smoke alarm program. Starting last Friday and through most of the weekend, the Red Cross provided canteening services and emotional support following a small plane crash in North Salem, N.Y. (Westchester County). Our hearts go out to the family and friends of those affected by this tragedy. Thank you to all who supported this response. Dec 3-6: For Long Islanders, we invite you to join us for the 20th Anniversary of Champions for Charity! Dec 5: Our #GetAlarmedNYC campaign needs volunteers to support daily installation teams every week. The campaign also needs volunteers to support our upcoming Mega Event in Jackson Heights (Queens) on December 5th. Sign up for a Home Fire Campaign shift today (link for Red Cross Volunteers).